With locations throughout the US, Bank of America is a convenient option but lacks perks you’d find at online banks. Check out this review to learn more. Bank of America (BoA) is a great choice if you want to easily access branches and ATMs across the country. However, you'll also find high fees, low-interest rates on savings products, and less than stellar credit card options. And that comes in an age where online banks are offering customers tons of low-fee, high-return banking options. In terms of personal banking services, BoA offers savings, checking, credit cards, and loans. But like most other big banks and especially compared to online banks, the interest rate for a savings account offered by BoA is weak. Bank of America has three checking account options: Advantage SafeBalance, Advantage Plus, and Advantage Relationship. All come with monthly fees. If you're enrolled in Preferred Rewards you don't have to worry about fees. This requires that you've had on average $20,000 or more deposited in eligible accounts for three months. Preferred Rewards is the only way to avoid the $4.95 fee associated with Advantage SafeBalance. For Advantage Plus, depositing at least $250 each month, or having a minimum daily balance above $1,500 will waive the fee. Advantage Relationship customers need to have a minimum balance of $10,000 across eligible accounts. To avoid these costs, you may want to consider lower-fee options, such as Chase or you may want to look at the best online banks. Tons of physical locations. Bank of America has a network of close to 5,000 branches and close to 16,000 free-to-use ATMs across 35 states. Convenient mobile and online banking tools. Customers can check account balances and activity, review statements and transfer funds between accounts. With the app, customers can deposit checks without visiting a branch. High daily limits on withdrawals. 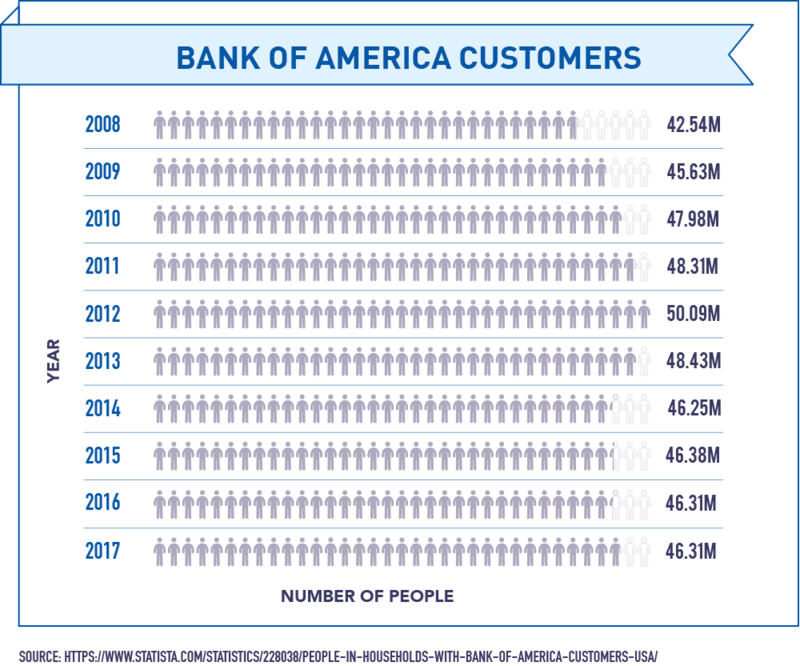 Bank of America stands out above others banks like Chase and Wells Fargo in one major way: its standard daily limit is an industry-high of $1,000 on ATM cash withdrawals and $5,000 on debit purchases. Intriguing offer for art enthusiasts.Bank of America's Museums On Us program allows debit and credit card holders to gain free access to more than 150 galleries and museums on the first weekend of the month. Low interest rates on savings accounts. Like other big bank options, Bank of America offers barely any incentive to open a savings account with them with a .03% interest rate. High fees on checking accounts. From a monthly $12 fee if you can't maintain a daily balance of at least $1,500 to a $35 overdraft fee (that can be charged up to four times daily), Bank of America's basic checking account comes loaded with fees. Better loan options at Wells Fargo.Wells Fargo is one of the top lenders in the personal loan space, as it allows joint applications for personal loans, which helps those with a low credit score. Higher earning potential with Discover checking. Discover offers a lucrative, cash-back checking account; every qualifying debit card purchase earns 1% cash back, giving you the potential to earn up to $30 in rewards each month. More appealing interest rates with Barclays. Another big-name bank, Barclays, offers similarly competitive high-yield savings options with 1.30% APY. Less fees with Capital One 360 Checking. There's no minimum requirement, no ATM fees, no foreign transaction fees, and no overdraft fees. Bank of America doesn't have the greatest credit cards on the market, but they do offer cards that are appealing. The Bank of America Cash Rewards Card. This not-so-bad rewards card offers 3% cash back on gas, 2% cash back at grocery stores, and 1% cash back on all other purchase up to $2,500 in combined purchases each quarter. Along with no annual fee, there's a sign-up bonus of $150 cash bonus if you spend $500 within 90 days of opening the account. The Bank of America Travel Rewards Card. You'll earn 1.5x points for every dollar spent on all purchases with this credit card. It also comes with a sign-up bonus of 20,000 bonus miles if you make $1,000 in purchases within 90 days of opening your account. If you're in the market for a new or used vehicle, BoA has favorable loan options, ranging from $5,000 to a maximum of $100,000 depending on a customer's creditworthiness. For new cars, loans start at a 2.99% APR, 3.29% APR for used cars and leases, which is standard. Basic business checking offers. BoA offers two options for business checking accounts, Fundamentals and Advantage. Fundamentals charges $17 per month and Advantage will run you $29.95 each month. It is possible to waive both of these fees. A second Fundamentals account is an additional $12/month and account management is $15/month. Each incoming domestic wire costs $15 and it's $16 for international. There are no extra fees for Business Advantage. 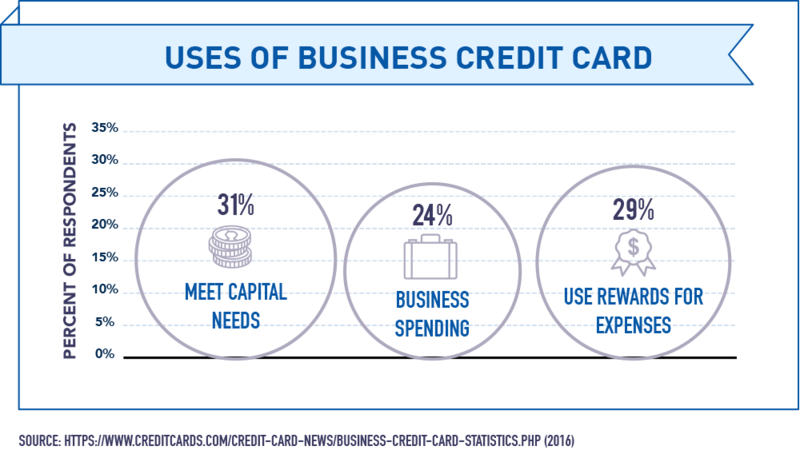 Appealing business credit card. The Business Advantage Cash Rewards Mastercard from Bank of America earns your business 1% cash back on every purchase, 2% on purchases at restaurants, and 3% on purchases at gas stations and office supply stores (up to $250,000 each calendar year, 1% after that) — quite decent, especially considering there's no annual fee. Convenient mobile and online banking tools. Through Bank of America's secure online portal, customers can access their account to view balances and activity, review statements and transfer funds between accounts. Highly rated app. 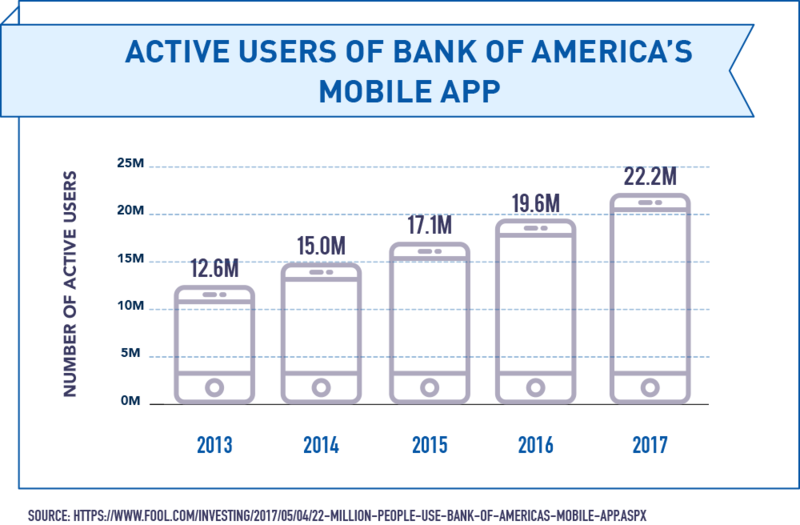 Bank of America's highly-rated mobile app (rated 4.6 out of 5 by users) makes it convenient to manage your account, redeem cash-back deals, pay for purchases using a digital wallet, and even deposit checks (by simply taking pictures of the front and back). You can use their online branch locator, or download their app on Google Play and iTunes. How do I sign up for a Bank of America credit card? Because Bank of America's customer service is so poorly rated, maybe your best option is to apply online via the bank's website. How do I cancel a Bank of America card? Dial 1-800-732-9194 to reach Bank of America's card services to cancel your card. In many cases, you will need to submit a written request for cancellation, as well as for a Statement of Account to view any remaining balance you are responsible for. How do I open a Bank of America account? Your best option is to apply online for a checking account, savings account, CD or IRA. You'll receive approval in one or two business days. What do I need for a Bank of America auto loan? You'll most likely be asked for a range of forms, including a purchase agreement/bill of sale, registration, title, lease buyout instructions, proof of income, federal tax returns, W-2s and financial statements. How long does it take for loan approval? When requesting an auto loan from Bank of America, you'll be notified within 60 seconds of applying. What overdraft protection is there for Bank of America checking accounts? You can opt for Overdraft Protection, which will automatically transfer available funds from your linked savings or credit card to your checking account if you overdraw it. Although it's a convienent option, due to its name recognition and plenty of ATM locations, Bank of America leaves much to be desired when it comes to many other aspects of banking. Its lack-lustre savings offerings and numerous high fees can make newer, low-fee online options a much more appealing option. Do you use Bank of America? How has it worked out for you so far? We'd love to hear what you think in the comments below.